Faye Gibbons is an old pro at children’s and Young Adult writing. An Auburn graduate and author of more than a dozen books, she won the Georgia Author of the Year award in 1983 for “Some Glad Morning” and the Alabama Author Award for “Night in the Barn” in 1998, given by the Alabama Library Association. Although she lives in Alabama now, Gibbons was raised in the hills of northwest Georgia and sets most of her fiction there. Her characters are generally rural and poor, struggling to get by but holding together, only by virtue of family, sharing, love, church, neighbors. (Gibbons is not, it should be noted, novelist Kaye Gibbons of North Carolina, best known for the novel “Ellen Foster.”) Often compared to Laura Ingalls Wilder because of her plucky and beleaguered girl protagonists, Faye Gibbons can also be usefully compared to Robert Morgan, especially his “Gap Creek” novels. Closer to home her work resembles the work of Kerry Madden of Birmingham and her Appalachian series featuring Livy Two of Maggie Valley, North Carolina, whose dream is to play music professionally, finally at the Grand Ole Opry. In a recent conversation with Kerry Madden I asked if there was a process or system to her YA novels. Yes, she told me: put your heroine up a tree and then throw rocks at her. Well, Faye Gibbons has certainly done that. Gibbons, an old hand at this subject, paints a convincing picture of Appalachian life during the Great Depression: exhausting work, collards and cornbread, sick cow, all of it, from the point of view of a relatively powerless teenage girl, her intended readers. Everyone works at Pa’s. Kate gets on at the textile mill, breathes lint all day and coughs at night. Pa takes her pay. Halley works at home cooking, hauling water, and so on. She also learns to “tuft,” that is, sew patterns onto chenille bedspreads. Many mountain women do piecework. Halley saves to get her daddy a tombstone but Franklin steals her money. Franklin even skimps on food. A complete hypocrite, he hoards money, except to buy himself fancy suits to preach in. Franklin’s passion is painting and nailing up “Jesus Saves” and “Are You Ready for the Rapture?” signs on trees around the town. As a character, Pa is possibly overdone. Nevertheless, I hated him desperately. Which was, I guess, Gibbons’ aim. Pa even whips Robbie for minor infractions and no one will stand up to him, including Ma Franklin, who is thoroughly cowed. Of course these are horrors to be faced and overcome or the whole crew would commit group hara kiri. 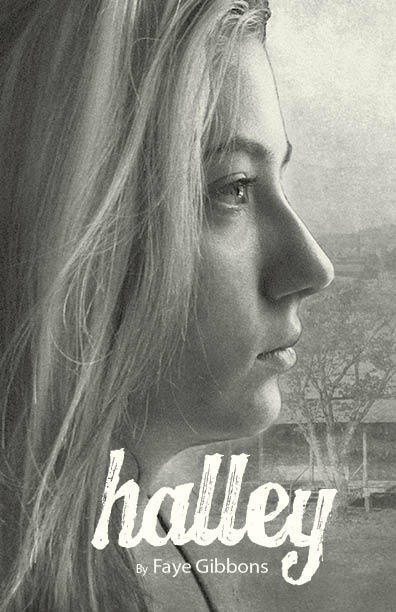 Among her many problems, for Halley the most painful is education. She yearns for school, and should be in the 9th grade, but doesn’t get to go. Halley hears of Martha Berry’s school in Rome, Georgia, run for poor mountain kids as a work-study coop, but Franklin is against all education. He doesn’t even want his son Gid to learn a trade at the CCC camp. Farming is the only respectable job for a man. For women: wifery and child bearing. Happily there are a few enlightened souls around, including an itinerant documentary photographer, Theodora, modeled clearly on Dorothea Lange, to encourage Halley. Things get better. Her mom finds love, Uncle Gid finds love, there is a rebellion in the house and Pa Franklin is humiliated.